KIEV '41 Lead the Germans or the Soviets to Total Victory! 427 backers pledged €44,753 to help bring this project to life. Kiev '41 is VentoNuovo's completion of the system created for Moscow '41 and Leningrad '41, now looking at Army Group South in the Barbarossa Campaign. Players take either the German or Soviet Union armies and use colorful wooden blocks to simulate the forces they have involved. Or get the "Everything KIEV '41" for the Ultimate in Satisfaction! The PLUS Pack (RP 25,00€) is included for FREE in ANY "Everything Kiev '41"
What do Opinion Leaders think of this Game Series? Watch the Video: Secret Tips from the Designer! 1. WHY THREE STICKER VERSIONS? The basic game includes the Standard Stickers, which have very limited historical/order of battle information so that they can make the unit type "NATO" symbol as large as possible. They are intended to be the easiest to play with. The Designer's Edition Stickers reduce the size of the NATO symbols but provide more historical information. (These are given for free for the first 41 hours.) The Icon Stickers show symbols like tanks and groups of infantry, because some players prefer this to NATO stickers. We have a detailed explanation about these differences that you can find by clicking here. The game includes the Game Map, that features a highly detailed map of the area plus other game graphics. The "Naked Map" is the same size as the Game Map but minus game graphics, showing a bit more landscape. The Mounted Map is the same size as the Game Map, but it is thicker. The Gortex Map is a larger edition of the game map, printed on a high quality PolyPropylene format /waterproof and fireproof (rolled). Find out more here. 3. What comes in the Historical Bundle? There is a good history of the campaign, which provides details and insights without having to work through hundreds of pages. There is also a Designer's Guide which is very detailed, explaining the process by which Emanuele worked to get as much historical detail into the game in a seamless way, that does not require the players to spend a lot of time on rules details or charts. 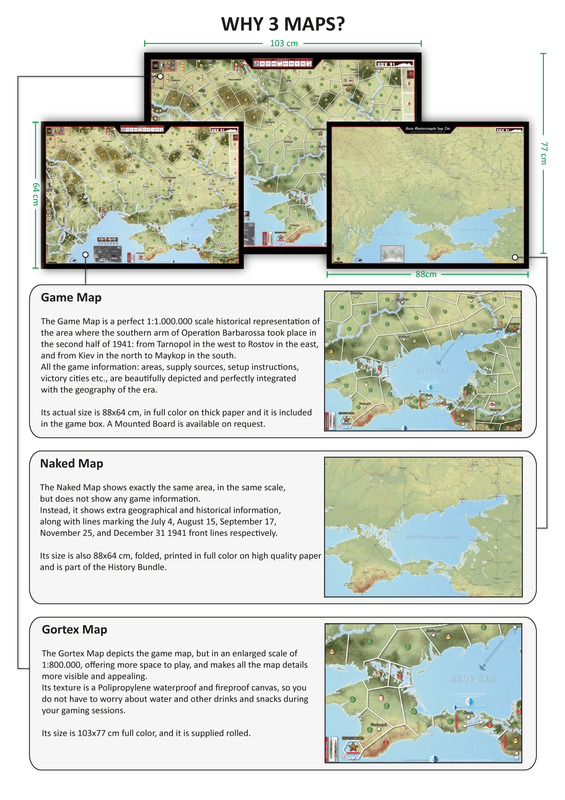 We also include the Naked Map, so people can study the battlefield without hexes or game graphics getting into the way. You can add the Mounted Map for an additional 27 euros, and the Gortex Map for 40,00€ (shipped in a separate mailing tube) , but we do not increase your basic postage fee. Remember, if your total order reaches 300 euros or higher (not including postage), your shipping is free! 4. Why are the shipping charges the same, whether I buy one game or several? This is something we do to make things simpler for us and encourage our supporters to select more games. Of course, it costs us a lot more to send you three or four games compared to one, but we have seen other kickstarters charge a pretty significant amount on shipping one game and then add more for everything extra that you buy. That seems complicated and discouraging to us, so we opt to make it simple for you and deal with the added shipping charges ourselves. 5. How can I find out more about how the game works? Check the "How to play Video" here. * Any combination over €300,00 gets FREE SHIPPING! This will be VentoNuovo's 10th game and 5th Kickstarter. All our previous games have been shipped successfully three months before our promised date. While there are always unanticipated little surprises in any game production, we are veteran publishers and very careful with our promises. The game will be produced in the EU, so we will not have any tales of "waiting for ships to sail" or "can't get past customs" like some other kickstarter backers have unfortunately endured. We are confident that our October commitment is a "no later than," and not an "if everything goes perfectly" deadline. A full refund is available not later than 7 days after the end of the campaign. After this, a partial refund of 50% is available before 30 days after the end of the campaign. Thank you for supporting "Kiev '41"
You have access to the FAQs, you will automatically receive all the Updates, and you can change your Pledge later, if you decide to jump in. One copy of "Waterloo 200"
One copy of "1914: Germany at War"
One Copy of "Stalingrad: Inferno on the Volga"
One Copy of "Bloody Monday"